We spent years searching for pad printing pads that performed well on the press, had a reasonably long printing life and were manufactured with care – oh, and that didn’t cost a fortune. We couldn’t find a brand that ticked all these boxes, so we decided to make our own. We call them Maestro printing pads because they put YOU back in control of print quality…. tacky, but TRUE. See our range of Maestro Printing Pads. Our own Australian made range of printing pads are the product of over $25,000 invested in extensive research into real world pad printing requirements and testing over many hundreds of hours by commercial printers to ensure sure they perform exactly as promised. Maestro pad printing pads are made from quality silicone compounds and additives formulated to promote scuff resistance, rapid recovery after printing, and to have exceptional ink transfer and anti-static qualities print after print. We take great care to ensure exceptional build quality and finish of every pad shape. If you run multi-colour machines, you will know how frustrating and time consuming it can be to try and bring a print into colour registration with pads that are not symmetrical, nor exactly the same shape, or differ in hardness. You will not have these issues with Maestro printing pads. Our pad shapes are carefully CAD designed to ensure symmetry and optimum pad roll. Each master is then CNC machined by our in-house metals workshop ready for moulding. Pads are a consumable, and they have a shelf life. Over time important additives migrate to the surface of the pad inhibiting print transfer, and over time the pad hardness (durometer) changes which also affects print quality. This happens to all printing pads whether they are in storage, or in use. Making our own product allows us manufacture short runs regularly to keep turnover high, ensuring all our pads are fresh, and within their specified durometer tolerance. This guarantees that every pad you buy from Colour Components is ready for use, and has the longest possible print life ahead of it. 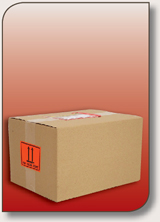 Everything you need to deliver consistent, quality prints. Maestro pad printing pads come standard on a quality 9mm marine ply wood base with a threaded insert for easy machine mounting. Aluminium bases, for clean room operations or specialised mountings, are an option. Maestro pad printing pads are manufactured in four standard durometers; hard, medium, soft and very soft. Custom durometers and dual layer pads are also available. Each batch of printing pads is tested in accordance with the international Si hardness measuring system, and quality assured to within ±2 Shore on the OO scale at time of manufacture. 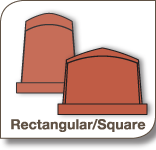 The ply bases are marked with the pad code and hardness for easy identification and re-ordering. All pad shapes are also available in long life and antistatic silicone formulations. Our R&D department is always working overtime with new products and additives, so watch out for new products and shapes to try! • the largest pad practical; larger pads reduce distortion of the printed image on uneven and curved print surfaces. Choose a pad shape similar to that of the image and/or product be printed as this often minimises distortion of the printed design. A round pad would be a better choice for printing a circular logo on a coffee cup than a rectangular pad for example. Most importantly, choose a pad profile that will create a rolling action outward from the point of the pad as it is compressed on the product surface. This pushes the air from between the pad and product surface while rolling the ink layer off, ensuring good ink transfer without pin holing. Ideally you should pick-up and transfer your image without ever creating a flat spot between the pad and the plate or product surface. So for a flat print surface a conical or ‘house’ pad would be ideal, where a flatter pad would work well on a highly curve surface like a pen barrel or wine glass. Rectangular pads are the most common shape used for general printing, and are best suited to oblong images and/or products. 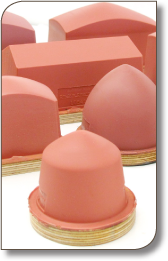 Conical and ‘roof’ shape pads are ideal for printing flat and textured products as the image rolls off the pad 360º around the tip (or up both sides of the ‘roof’). The steep pad sides maximise both ink pick-up and air exclusion for clean image transfer. Round pads are the obvious choice for printing circular images as they distort uniformly from the centre, and pick up the maximum the image area available on ink cup machine plates. Round pads can be used to print everything from button badges, balls (hollow pad), and even around knobs (donut pad). 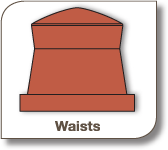 Having a waist allows a pad to compress to maximum surface contact without bulging outside its own footprint. This allows you to print images inside recesses, and very close to raised product edges that would not possible with standard straight sided pads. Hollow and holed pads are specially designed for applications where print distortion is caused by limited pad expansion around the product. 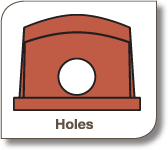 A hollow or hole allows the centre of the pad to compress more than usual, giving a larger print area on the product with minimum image distortion. Never wipe your pads with thinner! To ensure they retain their perfect printing surface and freshness, our printing pads are encased in a protective wax layer immediately after they come out of the mould. Carefully remove the wax and clean the pad with packing tape. Freshly made printing pads DO NOT need to be ‘activated’ with thinners. Some new pads, particularly soft ones, may have an excess of silicone oil on the print surface which can be removed with a soft cloth moistened with methylated spirits. 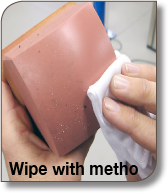 Wiping pads with thinners will leach silicone oils from the surface layers and reduce the life and performance of your pads. To extend the life of your pads, remove ink and dust from the surface with packing tape or soft cloth moistened with methylated spirits, then apply a small amount of Pad Rejuvenation Oil at the end of each days work. 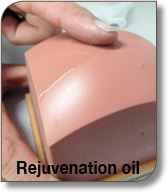 Regular application of Rejuvenation Oil will extend the life of your pads by replacing silicone oils to the surface layers of your pads. Store pads out of direct sunlight, on their base, and never in contact with other objects. If you store your pads in a cupboard or drawer, treat the area with surface insect spray regularly because cockroaches love to nibble at the silicone! Care and maintenance will ensure your pads give you a long service life. However pad silicones do soften with age, resulting in a gradual deterioration of ink pick-up and transfer characteristics. Pads should be replaced from time to time to maintain consistent print quality and quick, trouble free set ups.